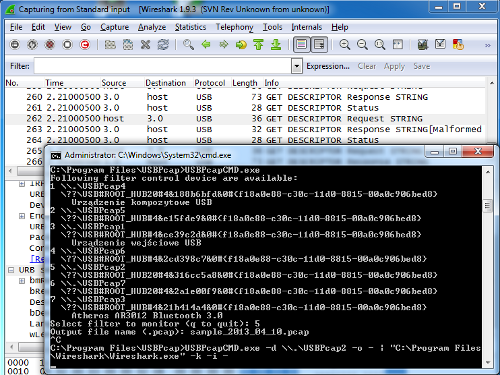 This short tour assumes you have installed the latest version of USBPcap and Wireshark 1.10.0rc1 (or newer) and rebooted your system. Each of the steps contains short description of what should happen and in some cases gives tips for troubleshooting. If you feel the information provided there is not complete (it doesn't cover your case), please describe your problem on the USBPcap mailing list. The first step is to connect the device you want to sniff the traffic and identify the Root Hub this device is connected to. In order to do so, launch the USBPcapCMD.exe that is stored in the installation directory. You should be presented with something similiar to the picture below. 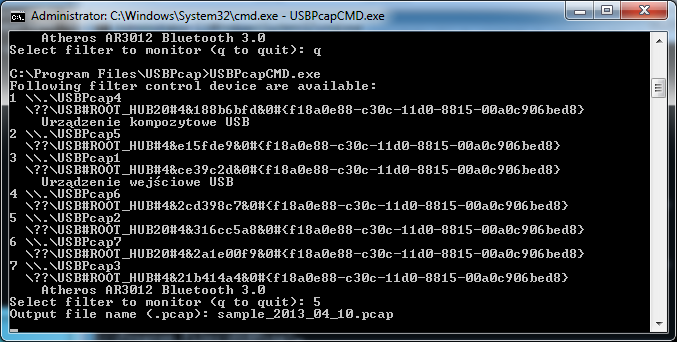 If for any reason you can't see the list of connected devices make sure you have the USBPcap driver installed and you have restarted your computer after the installation. So now you know which of the Root Hubs available in your system you want to monitor. 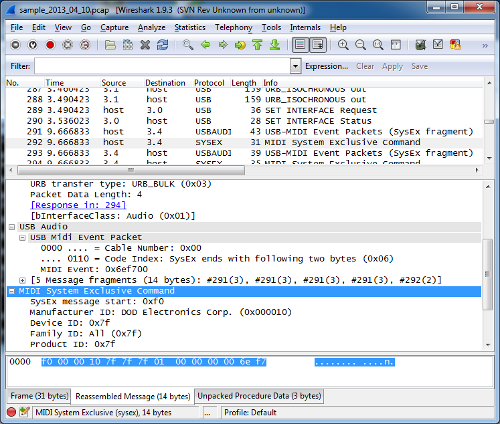 Please disconnect the device from your computer - this will allow USBPcap to capture the USB descriptors needed for analysis in Wireshark. 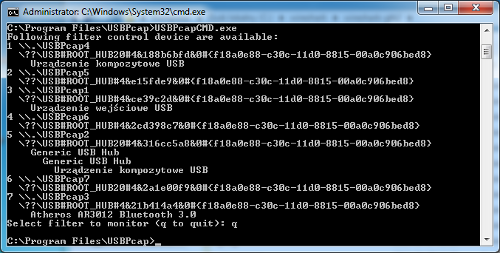 Now you can run the USBPcapCMD.exe again and enter your desired output file name. (A careful reader will notice that they can skip the restart part: all that required to get the descriptors in the capture file is to reconnect your device after capture has started.). We will be capturing the Root Hub that showed the two Hubs connected to it and an composite USB device (it is actually DigiTech RP250). 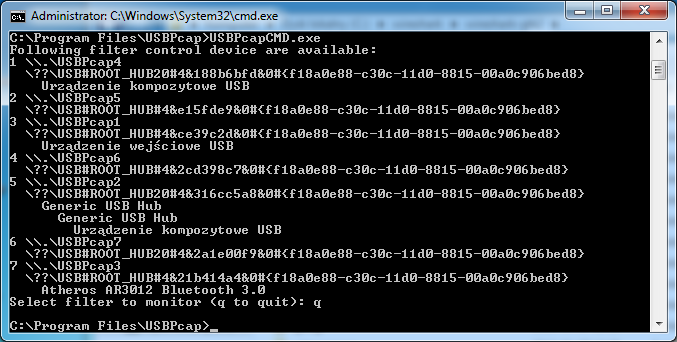 Now it is time to use the device in order to get packets captured. 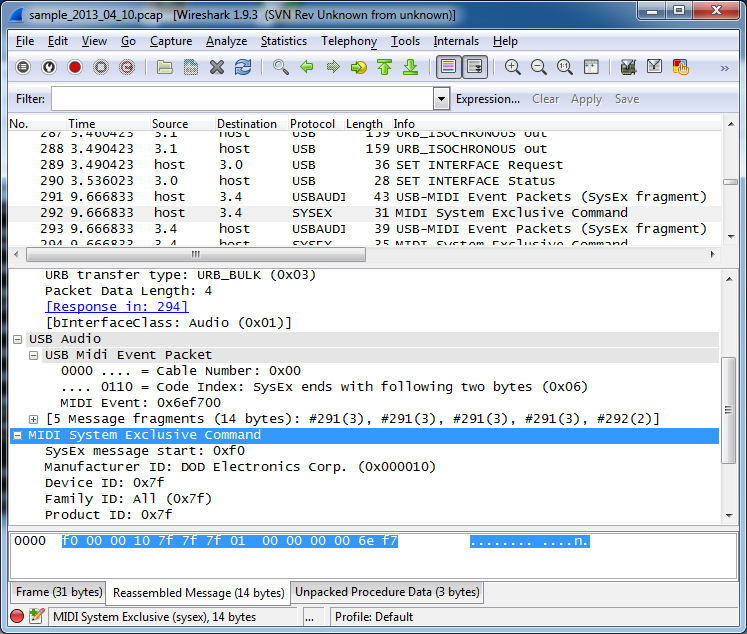 In this example I have simply started the X-Edit software that controls the DigiTech RP250. This should result in live capture from standard input in Wireshark as shown below. If you can help please check the menu on the right for links for github page, donation fund and contact information.